As this might be a little confusing for some readers, allow me to give you an example, a photograph from the 1898 Wingfields, when Harry Blackstaffe (Vesta RC) met the upcoming sculler Hunting Howell (Trinity Hall, Cambridge). A few weeks earlier, young Howell (in articles and reports always referred to as ‘B.H. Howell’) had easily over-come Blackstaffe in the Diamonds Sculls at Henley. 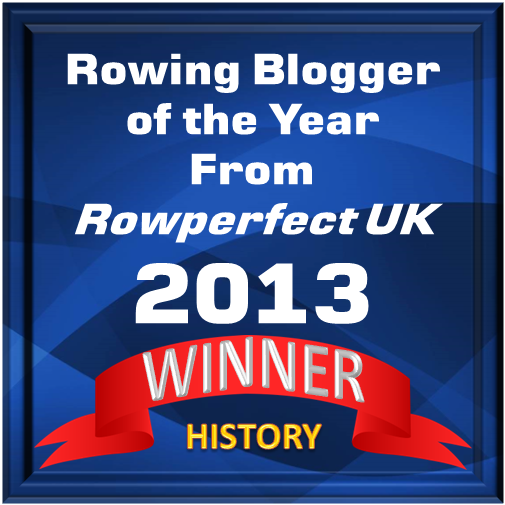 Although, Howell also beat the sculler from Vesta RC in the Wingfields that year, it was not with the same ease. 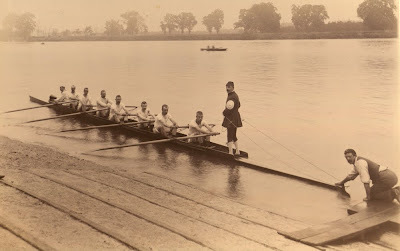 The interesting photograph on top, which is from Hunting Howell’s private photo album, now kept in The National Rowing Foundation’s archives at Mystic Seaport Museum in Connecticut, shows Howell’s ‘pilot boat’: seven oarsmen, one Doggett winner coxswain, and the ‘pilot’ in the bow seat, facing forward. 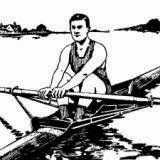 In a couple of minutes he is going to steer Howell over the Championship Course from Putney to Mortlake.